Studies of aeolian sediments, both ancient and modern, have exhibited a number of important conceptual advances in recent years. In particular, there has been a move away from descriptions of sediments, bedforms and sedimentary environments toward a new emphasis on the dynamics of aeolian depositional systems at different temporal and spatial scales, and their response to external changes in sea levels, regional and global climates and tectonics. This Special Publication contains a selection of papers that were presented at the Symposium "Aeolian Sediments: Ancient and Modern" held in 1990. It also includes a number of contributions from authors who were not able to attend the meeting, but whose work reflects important aspects of contemporary research in aeolian sedimentology. 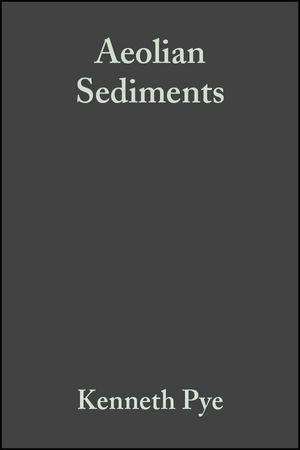 Kenneth Pye is the editor of Aeolian Sediments: Ancient and Modern, published by Wiley. N. Lancaster is the editor of Aeolian Sediments: Ancient and Modern, published by Wiley. Part I: Modern Aeolian Environments. Particle dislodgement from a flat bed by wind - a reanalysis of Willetts and Rice's data. Aeolian dynamics on the windward slope of a reversing transverse dune, Alexandria coastal dunefield, South Africa. Late Quaternary development of coastal parabolic megadune complexes in northeast Australia. The modern and ancient pattern of sand flow through the modern Namib deflation basin. Internal structure of an eolian dune using ground penetrating radar. Origins and sedimentary features of super surfaces in the northwestern Gran Desierto Sand Sea. Part II: Ancient Aeolian Environments. Eolian genetic stratigraphy: an example from the Middle Jurassic Page Sandstone, Colorado Plateau. Downwind changes within an ancient dunes sea, Permian Cedar Mesc Sandstone, S.E. Utah. Low stand eolian influence on stratigraphic completeness. Upper member of the Hemosa Formation (latest Carboniferous), Southeast Utah, USA. Draa reconstruction, the Permian Yellow Sands, N.E. England. State-of-the-art research papers in aeolian sedimentology. Of relevance to modern concerns about global climate change.